Dateline: Myrtle Beach, SC for release on: 12-27-2012 Haywire Custom Guitars Inc. of Myrtle Beach now offers RECESSED HEEL CREST Option-Free. This option is relevant to all Guitar and Bass players with: bolt on necks on their instruments. 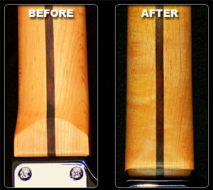 Haywire Custom Guitars Inc. of Myrtle Beach now offers RECESSED HEEL CREST Option-Free. This option is relevant to all Guitar and Bass players with: bolt on necks on their instruments. We move down the crest of the heel down approximately 7/8” on bolt-on necks. This option will be added after 12-7-2012 at NO-CHARGE. When desiring to play at the higher end of the neck past the 12th fret. The bulky heel crest wood blocks your hand, especially critical for those players that play more notes high on the neck. Haywire Custom Guitar Custom Shop can overcome that road block by recessing the heel crest so a player can explore more of the guitar easily. When fingers can reach more strings and frets, new ideas will open up. Guitar and Bass players will have "TOTAL ACCESS" to the neck with our Special ”Recessed Heel Crest” modification. “A Haywire Recessed Heel Joint Option will let you fly all the way up the entire neck with no road blocks to your playing. You will no longer have to alter your technique to continue playing farther up the neck to reach the high notes”.